When I arrived I viewed the house and felt that part of the dining area would make a possible studio. Then when my container arrived I organized all my books, my yarns, fibres and fabric that had been shipped. For my second Christmas (2014) I made all kinds of knit gifts for the people around me and also a new fancy sweater for myself. But to be truthful I have been so busy working here that I have not had great amounts of time to play with textiles. Not that this is not a dream, just busy putting the house together, gardening (which here is year round) and travelling. I have had a chance to meet the gentleman who lives in one of the Macas who weaves all the mostly red or blue ponchos, worn by locals. At some point I will try to visit him to see how these are produced. In addition, many of the older women in the Maca hills above me drop spindle yarn from their own animals. 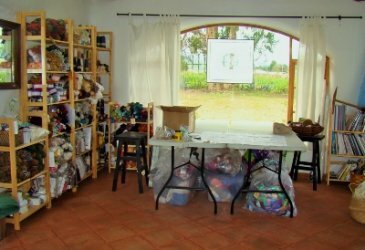 I also had a chance in 2014 to go to Cuenca where I met a number of textile artists including a felter. 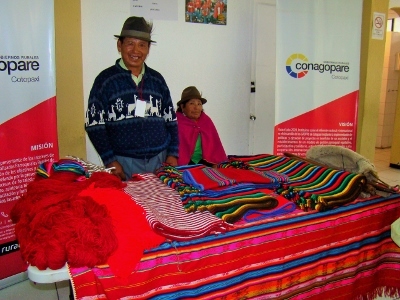 My efforts to connect with the weaver in Cuenca who has taught two of my Prince Edward county friends failed as she has sold her business. However, I have now discovered a new felter in Buenos Aires, Alejandra Rodriguez, and she may warrant a visit. What a great additional reason to go to Argentina. Then perhaps back to some textile explorations. 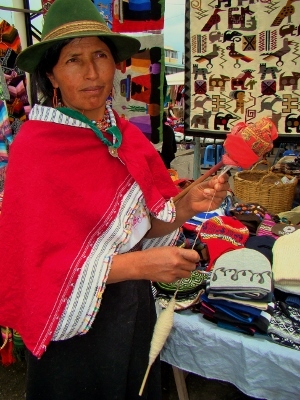 Ecuador does have a number of special textiles many made in the Otavalo area. Some of these you can buy at the market in Saquiisli. And of you look up you will see the colourful table cloth used by the weaver. That is actually one that I own and it also was made in Ecuador and comes in many other wonderful colour variations and sizes. Some friends in Canada have received these as gifts and they do make great purchases for visitors to take back home. There is a charming shop in Latacunga which stocks many of these.